It’s not hyperbole to say that in 2017, Chicago has a reputation for violence — in particular, gun violence — and a Black community that takes the worst hit of any in the nation’s third largest city. Now the focus of a one-shot story in DC’s historically most violent title, Chicago becomes the scene of Deathstroke’s latest contract. Steering this story through choppy political waters is regular series writer Christopher Priest, joined by two other modern masters of the comic medium: penciller Denys Cowan and inker Bill Sienkiewicz. 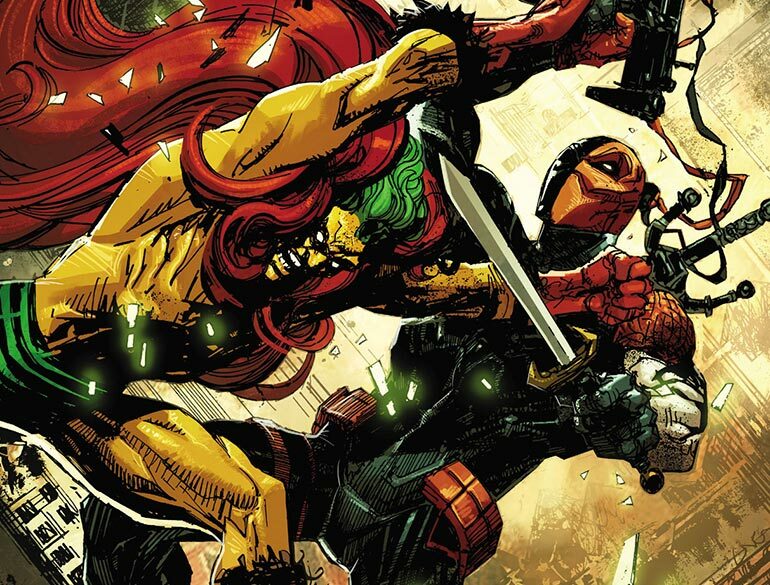 Priest and Cowan sat down for an extended interview with Comicosity to talk about the politics of the issue and what it was like placing Deathstroke and the Creeper right in the middle of real life tragedy. Matt Santori: I don’t want to get too “after school special” about it, but Deathstroke #11 isn’t just special because of its content, but also because of its creative team coming together to produce it. How did this all come about and what drew each of you to the topic? Christopher Priest: Since Deathstroke is a twice-monthly comic, we’re tasked to produce inventory stories, in case there’s a problem with production — sort of like a fill-in. I wanted to do a story that was anti-violence. Mainly because everything I see in comics, TV, film, video games — you name it — virtually everything I see in entertainment these days involves conflict resolution by means of violence. Rebels blow up the Death Star, killing I don’t know how many thousands of people, or this army beats that army. Or the cops shoot down the robbers. That’s the climax of the film or the movie or the TV show or the comic book. Then everyone rejoices and high-fives or whatever. First of all, it’s become boring. It’s lazy writing and cliche. You can go to almost any movie and predict how this thing is going to work. We have this terribly violent society, so I thought an anti-violence message would be in order. 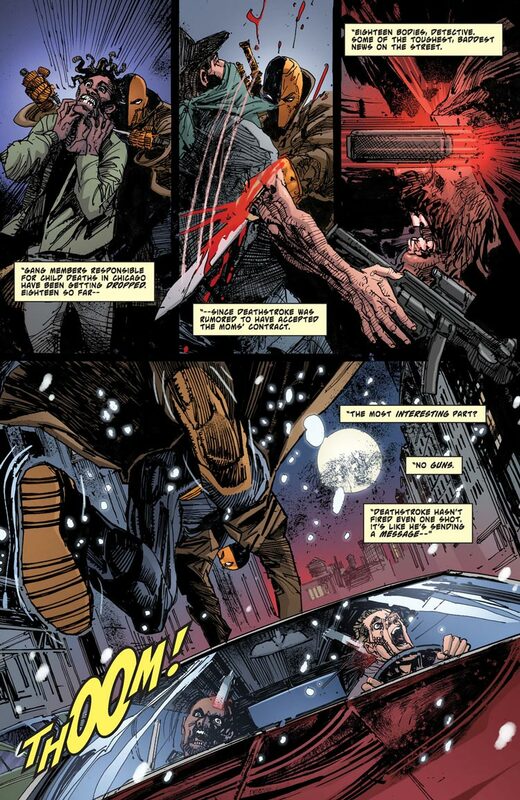 And I thought if DC were to do an anti-violence story, what better place to do it than in Deathstroke? A book that is all but glorified violence. With that intent in mind, I started thinking about what kind of story we could tell. That was right about the time of one of those terrible weekends in Chicago with just an enormous amount of shootings going on. I thought, well, that would make an appropriate subject matter. Then I reached out to my friend Reginald Hudlin, the film producer and director and principal of Milestone Media. I talked it over with him and asked if he’d be interested in co-writing. He said he didn’t have time, because he was busy directing the film Marshall. We did spend some time on the phone, however, kicking around ideas and he brought up the Clint Eastwood film, Fistful of Dollars. The story that I’m telling is very similar in some respects, so that really got the ball rolling in terms of plot. I thought this would be an appropriate vehicle for a Milestone Media comic book, so my first thought was for the person to draw it would be Denys Cowan. He was busy doing some Marvel work and some other things, but since this was a fill-in comic with no set place in the schedule, I thought he could take his time and squeeze it in between whatever else he was doing. Then, of course, once Denys said yes and agreed to do it, DC scheduled it immediately and we all had a gun to our head to finish it. [laughs] But that’s just how it works sometimes. Denys Cowan: I mean, that’s pretty much how it went. I always welcome the opportunity to work with Mr. Priest. The last time we probably worked together on anything ongoing was Steel in the early 2000s. And I’ve always wanted to work with him again. So, having this opportunity again was great. Also, he’s right. This was structured a lot how we did do and how we will do future Milestone Media books, so it was a great opportunity to explore working that way again. And collaborating with Reggie Hudlin, even unofficially, was just the icing on the cake for me. MS: Let’s talk a little about my hometown Chicago. What aspects of your art style were designed to play up the look and feel of the city? DC: The thing is, the story is called “Chicago,” and the city of Chicago is as much a character in the story as any other. 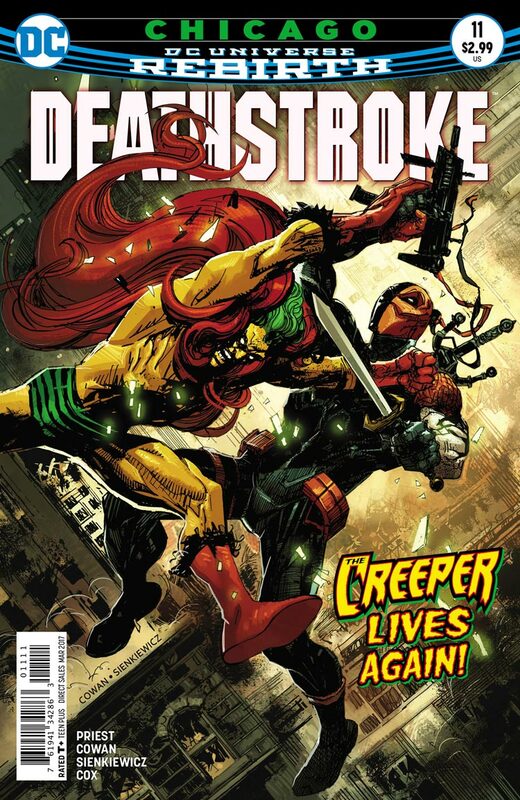 It might be more of a character in the story than Deathstroke himself, if you really look at it. I enjoyed it, and it was a lot of fun. I think that in order to really draw a place, you need to have been there. I’ve been to Chicago several times. Both times I had a great time, but I also recall both times feeling — like, I love Chicago, but there’s an underlying thing about it. When it was cold, it was REALLY cold. And the people are really resilient. And for me as a New Yorker, I was like, goddamn, how can they take this? These are some tough people. 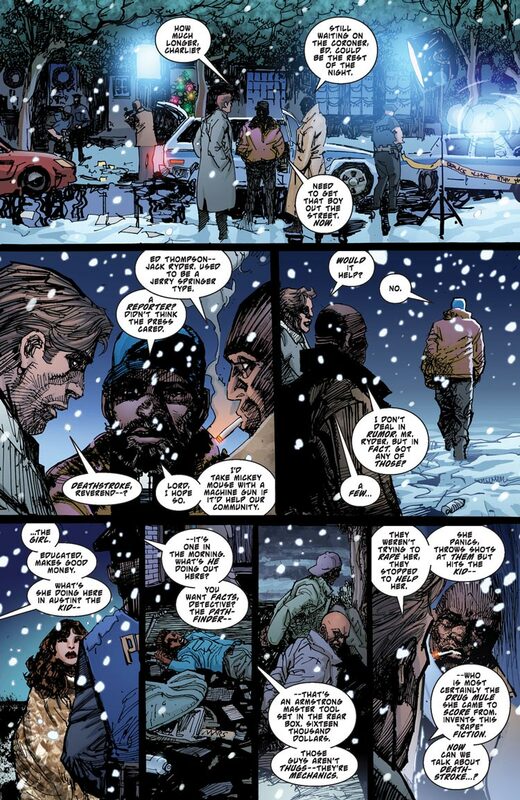 The story takes place at Christmastime, and I remember drawing the issue and wanting to get across that sense of cold and inner toughness of Chicago itself. It wasn’t as much the architecture, which is great, and I tried to incorporate as much of that as I could. But it was more like the feeling of the city and the feeling of the residents of the city and their resilience. Just trying to capture that in the art was definitely what I was aiming for. 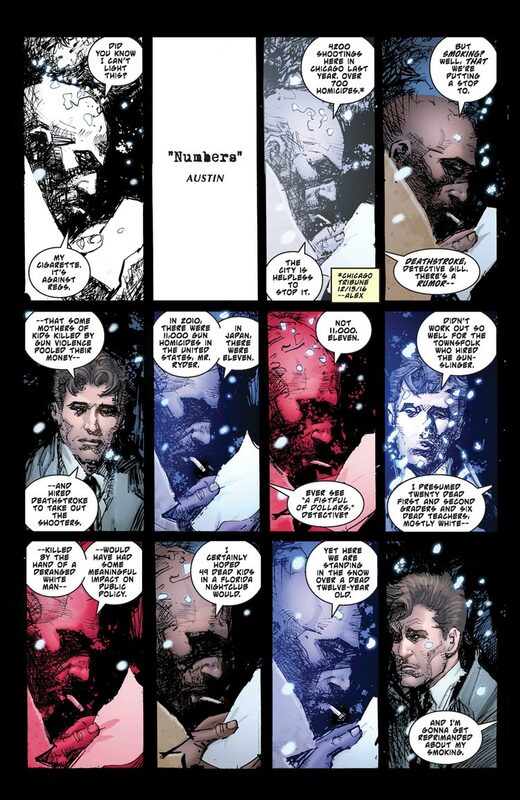 I got the chance to work with Bill Sienkiewicz, who inked the story, and who is an awesome artist. And he was able to get across that sense too. Every time we showed someone outside, it was always snowing. There was always flurries. And there was always something going on to indicate you were at a real place, not just some kind of comic book room. CP: What makes this uniquely Chicago is not the architecture, but the situation. We have similar situations in Pittsburgh, Philadelphia, Kansas City, and other distressed places around the country. But Chicago is really at this point in a crisis mode, not only in terms of guns, but in terms of economic crisis and other things going on in the city. One thing feeds into the other. Economic issues feed unemployment, which creates the kind of stresses that lead to the type of violence that goes on in the inner city and so forth. That was really my thinking there. Originally, I thought DC may want me to change the story and set it in a fictional town like Central City or Coast City or something like that, but I’m really pleased — and I’ve got to tell you, a little surprised in a good way — that not only did they not ask us for a change to fictionalize the city, but we received nothing but encouragement and support. DC was just so supportive of the project. MS: With Chicago, there’s really two sides of the coin for the threat of gun violence. There’s the street-level violence that you’ve discussed and then there’s the side driven by the Chicago Police Department. How do you negotiate that aspect going into the story? CP: I think that the story spreads the blame around. Are there issues with the police department? Absolutely. But at the same time, these guys are under an incredible amount of stress and under threat 24/7. That doesn’t ameliorate any overreactions or risky behavior on their part, but at the same time, we can’t let criminal or disturbing aspects of the city off the hook either. My problem with a lot of the movement toward seeking justice for people of color who have been harassed by the police is that in many cases, we end up whitewashing the story of the victim. For instance, if I’m going to contrast Michael Brown to Trayvon Martin — there’s a lot of tendency to lump these victims together, along with any number of other victims of police overreaction or injustice. But the fact is, between Trayvon Martin and Michael Brown, there are two very different instances. And very different people. Trying to fit Michael Brown for a halo by not mentioning inappropriate behavior on his part, either prior to or during the incident, doesn’t serve us well. Because people catch us in that lie, and the sympathy for our cause, or the empathy, evaporates. While we are outraged and upset — and certainly Michael Brown did nothing to deserve to be shot to death — let’s not paint this guy as some sort of saint. Meanwhile, Trayvon Martin may or may not have been a saint. I don’t know. But he was a guy just minding his business, and some lunatic followed him and shot him down. Putting those two together just so we can have a convenient story or a more effective story — that’s what they do. And by “they,” I don’t mean white people, but people who create propaganda to achieve some sort of victory. I want us to be truthful about wrongs done to us, but also about wrongs that we’ve committed. If we’re in the process of a criminal act, or some sort of antisocial behavior, if we’re attacking police officers or resisting arrest, or trying to settle some beef about injustice with the cops on the street, that’s wrong. That’s not where you settle that beef. When a law enforcement officer gives you a lawful instruction, we’re supposed to follow it. Not argue with the guy and frail around and run and carry on. If you feel the cop is wrong, take him to court. That’s what the court is for. I feel like nine out of ten of these incidents would have been won in court, with the cop disciplined or fired, if we had just brought it to court instead of duking it out with the cop on the street. In our Chicago story, there’s plenty of blame to go around. There’s the cops. There’s the mayor. There’s the economic system going on. The school system. There’s a lot of bad parenting going on that no one wants to talk about, because we want to be the aggrieved party. We don’t want to admit that we’re not doing our part at home. There’s this blame to go on all areas. That’s the only message this book sends: that we’re all to blame. We all have skin in the game. Now, how are we going to come together to fix it? MS: Circling back to one of the original points: you’re writing this story for Deathstroke, whose lead is traditionally a huge gun-wielder. It’s an interesting point in the plot that you have the character choose not to use guns. What drove that decision and the idea behind solving a problem of violence with more violence? DC: I don’t know if Priest mentioned this, but in this issue, we’re not attempting to solve any problem. We are attempting to ask a lot of questions, but not provide any solutions. It’s going to be up to all of us to provide the solution, and a comic book is not going to do that. But what we can do, besides entertain people, is raise a whole lot of questions and see both the good and the bad here by raiding these issues. So, I’m pretty sure we weren’t trying to do a “message” kind of comic. MS: Yeah, let me clarify: I meant the idea of solving the problem of violence with violence from the character Deathstroke’s point of view. DC: Well, it’s funny, because if anything, there are other characters in this that are just as important as Deathstroke. 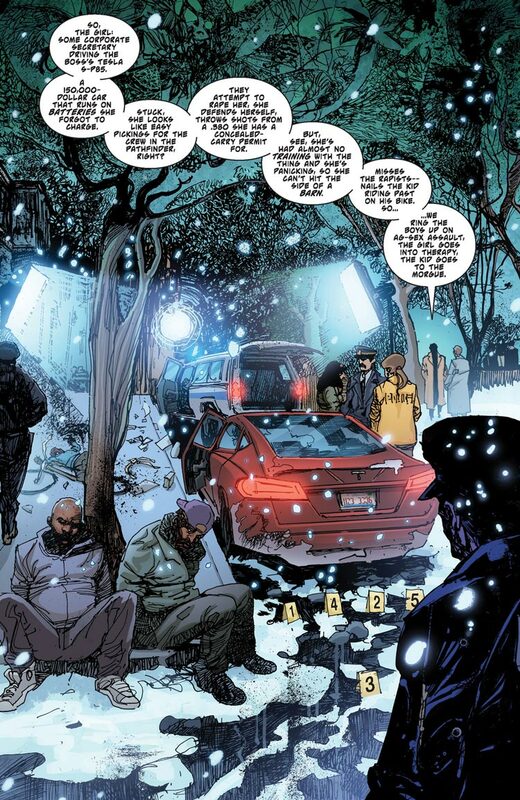 He makes an appearance, but the way in which he does that is so unique, that the other characters and the city of Chicago are speaking a lot more than he does. The flip side of that — and this is in the script — is taking your guns away doesn’t solve the problem. I can still do a whole lot of damage without guns. I am not anti-gun. I am a gun owner. I am an NRA member. I am not anti-gun by any stretch of the imagination. I am anti-stupid people having guns. And I am anti-kids having guns. And I am anti-whatever the hell is going on in Chicago. So, I don’t want this to be an anti-gun message, which is what these sorts of discussions tend to turn into. Then you have the right wing versus the left wing and we all know how that works. I’m just saying that whatever is going on in Chicago is tragic and awful and needs to stop. MS: One last quick question: you’re bringing in the Creeper with all of his history. He’s definitely a more flamboyant character coming into a rather somber or serious space. How did that come about? CP: Well, we weren’t really trying to bring the Creeper in. We’re trying to bring in Jack Ryder. We needed a reporter, and long story short, we went through a list of DC Comics reporters. I thought about making up my own, but DC has such a rich universe full of character, surely there must be a character we can use. When I came across Jack Ryder, I thought he would be perfect for this. He’s a freelancer now and ex-Jerry Springer type, so yeah! Let’s bring in Jack Ryder. Of course, over the course of the story, it became obvious that if you’re going to have Jack Ryder walking around, you have to at least have the Creeper make a cameo appearance. The Creeper is not really a major player in the story. But at the same time, because he’s the Creeper, when he pops out, boy does he pop out. He’s bright yellow against a really drab tapestry, and he brings humor and so forth into the mix as well. DC: When I saw we were going to use the Creeper, I was eager to draw him. I wanted to go back to the Ditko version, because I’m a big Steve Ditko fan. That was the reference more than anything else. I hadn’t known that version of the character hadn’t appeared in years. So, we were really bringing him back in a way, and I couldn’t be more thrilled. 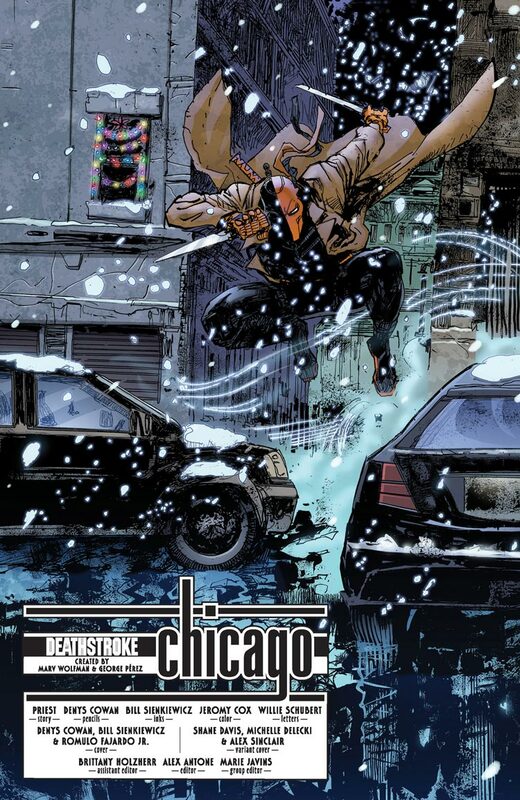 “Chicago,” a single issue story appearing in Deathstroke #11, arrives in comic shops and online tomorrow, written by Christopher Priest with Reginald Hudlin consulting, with art by Denys Cowan and Bill Sienkiewicz (like, wow).